Cutaway of the Polyus 1 space weapons platform. Russian military anti-satellite system. The Polyus military test bed was put together on a crash basis as an answer to America's Star Wars program. Missile defence technology satellite, Russia. Launched 1987. AKA: 17F19DM;Skif;Skif-DM. Status: Operational 1987. 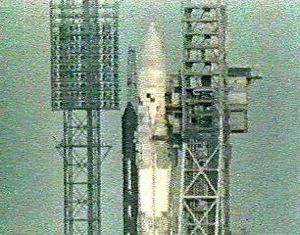 First Launch: 1987-05-15. Last Launch: 1987-05-15. Number: 1 . Gross mass: 80,000 kg (176,000 lb). Height: 37.00 m (121.00 ft). It was built around a surplus TKS manned spacecraft and was meant to test prototype ASAT and Star Wars defense systems. It failed to reach orbit, but it had succeeded, it would have been the core module of a new Mir-2 space station. Its mere presence could have decisively changed the shape of the Cold War in its final months. 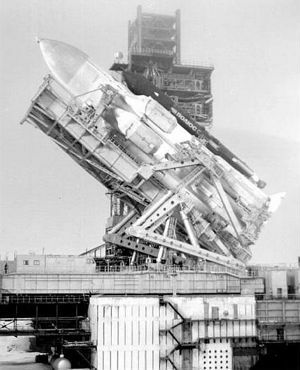 In 1985, it became clear that the Energia launch vehicle would be ready for launch before the Buran space shuttle that was its intended payload. Therefore Ministry of General Machine Building (MOM) issued a resolution ordering the launch of Energia with a mock-up of a spacecraft in the 100 metric ton class. In July 1985 General Designer D A Polukhin called together his workers and noted that MOM Minister O D Baklanov had given them the assignment of producing a 100 metric ton 'functional mockup' satellite by September 1986. It would normally take five years to develop such a spacecraft, and they had only one year - therefore it would have to be greatly simplified. The systems in development for the next generation of spacecraft at that time consisted only of equipment items in test configuration. KB Salyut had a range of spacecraft in production, including the 20-metric ton TKS manned logistics vehicle. The Skif-D 100-metric ton space platform was only in the design and drawing stage. The bureau proposed to create a spacecraft from a test stand version of the TKS mated to a mock-up built to the Skif-D drawings. 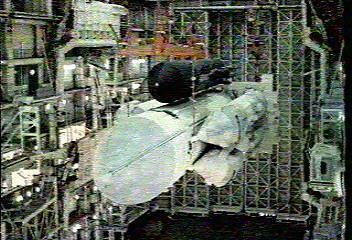 Several modules and subsystems were also borrowed from the Buran. Major subcontractors included NPO Elektropribor, NPO Radiopribor, NPO Digital Mechanics, NIIMASh, KBKhM, and the Progress Factory. On 19 August 1985, MOM issued the detailed schedule for the spacecraft's completion. The Skif-D and all subsystems were delivered to Baikonur in August 1986. From August 1986 to January 1987 the Skif-DM underwent integration and final tests at the space center. The Polyus testbed contained means of defense against both ASAT weapons and beam weapons, though according to Kornilov's article these were only meant to conduct approach and docking tests. A cannon was mounted on Polyus to defend against ASAT weapons. An optical sighting system for the defensive cannon was included in addition to a sighting radar. By this means hostile ASAT weapons could be tracked without generating traceable signals. Experiments to check the efficiency of barium clouds in diffusing particle beams were also to have been conducted with Polyus. The spacecraft was about 37 meters in length, 4.1 meters in diameter and weighed about 80 metric tons. An article entitled "Unknown Polyus" by Yuri Kornilov, Chief Designer of the Salyut Design Bureau, had appeared in the journal "Earth and the Universe", and it provided details about the construction and testing of the first payload for the Energia rocket, the "Polyus" spacecraft. While Kornilov invites the reader to "read between the lines" and points out previous Soviet mis-statements about the Polyus, he was under a security ban which would lead to a 10 years in prison if he reveals (Soviet) "state" secrets. His article continues to claim that weapons systems tests were peaceful experiments. On March 23, 1983, United States President Ronald Reagan set forth his vision of "Star Wars", a shield intended to defend the United States against nuclear attack from any place on Earth. The leader of the Soviet Union, Yuri Andropov, immediately accused the United States of seeking to militarily dominate the Soviet Union, and it kept he also authorized the design of counter-measures, including Polyus. Andropov sought to bring about a treaty banning military weapons from space until he fell ill in June, 1983. The Soviet space program ran on a five year cycle and Kornilov complained that the Polyus spacecraft had less than the customary five years for development. 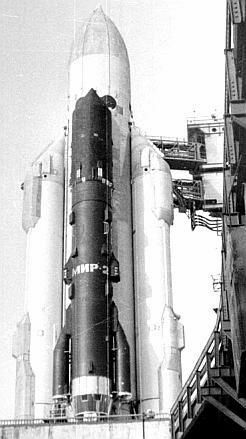 It was decided that the Polyus would be the payload for the first launch of the Energia heavy lifter, then scheduled for the fall of 1986. Kornilov gives no reason for the rushed development. Kornilov then goes on to declare that because of this rush Polyus was created by combining components from several current projects. The interface between Polyus and the Energia booster was adapted from the Buran Space Shuttle. The central module was adapted from a module for the Mir 2 Space Station. The replaceable and returnable space station to house cosmonauts was adapted from the upgrade of the existing TKS Transport Supply Spacecraft (Kosmos 929, 1267, 1443, 1668). Since the interface of the replaceable space station with the Proton launch vehicle was adapted to interface it with the central module, the rocket engines for orbital insertion had to be placed in the nose of the vehicle. This placement had catastrophic consequences for the Polyus spacecraft. After Andropov's death in February, 1984 his successor Konstantin Chernenko continued to press for a treaty banning the militarization of space. None the less, apparently following the successful test by the US Army of an anti-ballistic missile on June 12, 1984, and the rejection of a Soviet diplomatic initiative on July 1, construction of the Polyus began at the Khrunichev Factory. Design and construction of the platform was given the highest priority, and was under the personal supervision of Armaments Minister O D Baklanov (who later organized the coup against Michael Gorbachev) and Vice Minister O N Shishkin. These two met weekly with project leaders and issued immediate orders for the production of any needed components. Chernenko's successor Michael Gorbachev denounced the militarization of space on his first diplomatic trips abroad in December, 1984. Following Chernenko's death on March 12, 1985, and his becoming leader, Gorbachev proposed a freeze on the development of space weapons. Statements made at that time by Gorbachev confirm the impression left by this article and another by General Designer V.V. 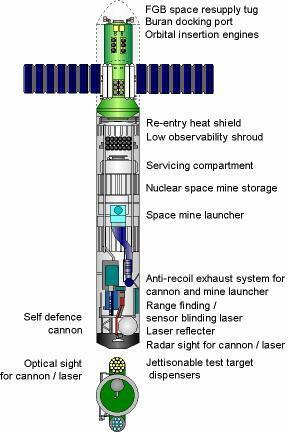 Pallo of Design Bureau Salyut that the Polyus was indeed a test bed for the Soviet counter measure to the United States "Stars Wars" program, an Orbital Weapons Platform. Platforms of this type would have been capable of delivering nuclear warheads from orbit to any point in the US in six minutes. Gorbachev pointedly called all US SDI technology "space strike" weapons and repeatedly warned that the Soviet response to Reagan's Strategic Defense Initiative (SDI) would be "asymmetrical" and that SDI was "destabilizing". It kept that the nuclear warhead launch control system for the Orbital Weapons Platforms was being developed in a very rushed manner and the instability of the Orbital Weapons Platforms scared the Soviet leadership. According to Kornilov's article, shortly before Polyus' launch President Gorbachev visited the Baikonur Cosmodrome and expressly forbid the on-orbit testing of its capabilities. Kornilov claims that Gorbachev was worried that it would be possible for the west to view this activity as an attempt to create a weapon in space and that such an attempt would compromise the country's leaderships' statements on the USSR's peaceful intent. Kornilov points out a laser reflector but gives no information on any scientific experiments using it. He also states that personnel on ships, aircraft and the ground were to take part in experiments with Polyus. It kept they were to attempt to target the platform by radar, infra-red and visible light, and when the platform was detected they were to fire at it with lasers. If the laser hit the platform, the mirror would reflect it back to Earth, and thus the platform's stealthiness could be tested without making radio transmissions. Earlier launch pad photos showed that the Polyus was covered by an optically black shroud and it was suspected that this may have been radar absorptive as well. The Polyus test bed had containers filled with a combination of Xenon and Krypton gases, which would produce light when released in Earth orbit. Container launches would be visible to ground observers, and a warhead launch system could thereby be tested without the use of radio transmissions. Because of acceleration stresses the original flight plan called for the Polyus platform to ride back-end first under and in the wake of the core stage of the Energia rocket as it passed through the Phase of Maximum Dynamic Stress after launch. Since the engines for orbital insertion would then be in the nose it would be necessary for Polyus to yaw 180 degrees and then roll 90 degrees before they could be fired and Polyus placed in its working orbit. When the platform was finally launched on 15 May, 1987, the Polyus performed a 180 degree yaw turn and then continued the turn through to 360 degrees. Polyus then rolled and fired its orbital insertion engines, which caused it to de-orbit into the South Pacific. Polyus's failure to achieve working orbit was caused by a faulty inertial guidance sensor. In the rush of construction an already built sensor had been stripped from an existing Cosmos spacecraft and then been inadequately tested, as the Polyus mock-up had been shipped to Baikonur by the time the test equipment arrived at the Khrunichev Factory. Those responsible for the failure were immediately fired or demoted. No member of the Reagan or Bush administrations ever admitted or revealed publicly any knowledge of Polyus. The US Navy made no statements about any attempts to investigate the wreckage of Polyus, which lies on the floor of the South Pacific. Family: anti-satellite, Space station orbit. Country: Russia. Launch Vehicles: Energia. Launch Sites: Baikonur, Baikonur LC250. Agency: Chelomei bureau. Bibliography: 102, 224, 367, 385, 89. 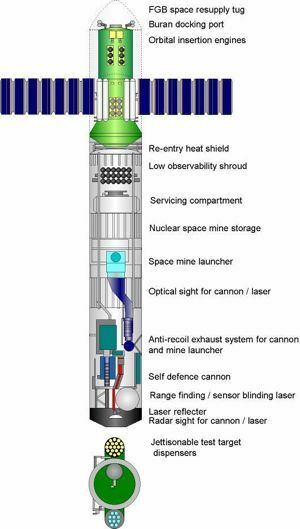 Large-size cutaway drawing of the Polyus 1 space weapons platform.